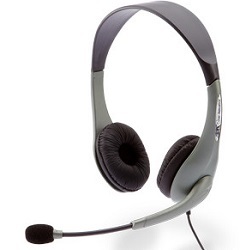 Slick, comfortable, and awesome quality, the AC-850 USB stereo headset is a great choice for anyone doing Voice Over iP and gaming. Bring your ears to attention with the AC-850’s 30mm dynamic drivers. The adjustable, over the head design fits comfortably on any head size, and the flexible, noise-canceling boom mic’s 180-degree rotation gets the job done, no matter your preference. The in-line volume control and mute switch are conveniently located within reach, and comfort is no issue with the AC-850’s soft, leatherette ear pads. Listen to crystal clear USB digital audio in style.